The Mentoring Center works diligently to provide youth and adults of our nation's most economically challenged communities with lifelong mentors, paths to personal success and productive citizenship. The Mentoring Center works with community and faith-based organizations, local business owners, and governmental agencies to create innovative solutions that meet the needs of our diverse population. Lisa Wilson, COO, delivers the remarks at the United States Citizen and Immigration Services, West Palm Beach Field Office. We fulfill our mission providing culturally sensitive services for all members of our community. Our leadership team works professionally and personally, to improve the lives of all very low income residents. We've provided immigration mentoring for more than 2,500 people form 23 different countries; including assistance with completing TPS for Haitian nationals. Our center relies on more than 25 active volunteers who help daily to fulfill our mission, They run programs, committees, mentor, tutor, facilitate workshops and help with daily operations. We save more than $75,000 in operations costs per year thanks to our volunteers. Leveraging partners' services, resource and networks helps us sustain programs the make a difference. More than 1,000 donors have contributed to the Mentoring Center. 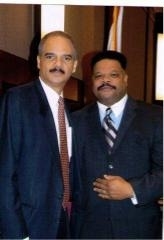 US Attorney General, Eric Holder meets with Executive Director and learns more about the Mentoring Center.